When it comes to big rigs and diesel trucks, the big name that most people know is Cummins. 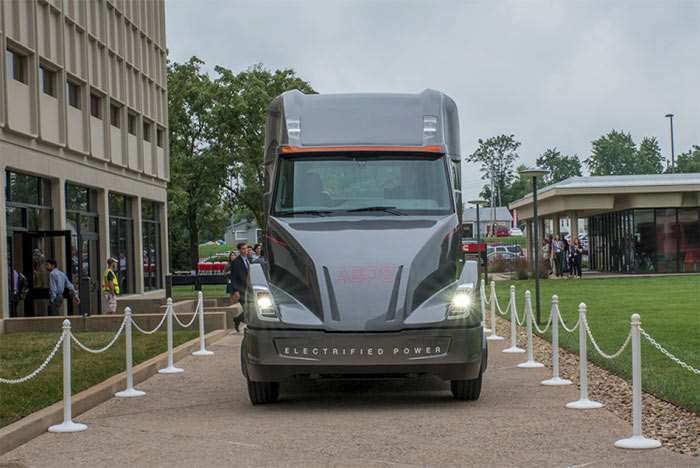 While Cummins says that diesel engines will continue to be the most popular option for years to come, it is looking to a future with other power technologies for big rigs. To that end the company has uvnield its Aeos electric concept truck. In concept form the day cab configuration has a gross vehicle weight limit of 75,000 pounds. When fitted with a 140 KWh battery pack it is good for 100 miles of driving per charge. That range can be extended to 300 miles with additional battery packs. Cummins says that when the 12L diesel engine is removed along with the transmission and the other drive components, the truck weighs about the same with the electric drivetrain installed. The truck is highly aerodynamic to help range and uses cameras in the dash instead of side mirrors. There is no word on when or if a production truck using that powertrain might debut.